A security guard has been airlifted to hospital after a fire broke out on an old sea fort in the North Sea. 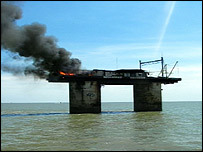 The blaze on Friday has badly damaged Sealand, an inhabited former military platform, about eight miles east off the coast of Essex and Suffolk. A coastguard spokesman said it was believed a generator caught fire. The one person on board was airlifted to Ipswich Hospital. The so-called "independent state" of Sealand is home to an internet firm. A helicopter from Wattisham airfield rescued the injured man from the platform and Harwich lifeboat were also called to the scene. Britain built the anti-aircraft platform during World War II. It remained derelict until the 1960s when a retired Army major, Paddy Roy Bates, took over the 10,000 sq ft platform and declared it the independent nation of Sealand. At the time, the platform was beyond the then three-mile limit of British territorial waters. All this changed in 1987, when the UK extended its territorial waters from three to 12 miles. The British Government does not recognise the sovereignty of Sealand.